In Fight the Zombiearchy for Suited: The RPG, players take on the roles of randomly generated 1950's housewives, armed with an assortment of household knick-knacks, toys, tool shed weapons, and jewelry. Their goal? To survive, to live, and to complete the randomly generated 3-5 Hour One Shot mission created for them by the Game Master using the included Mission Generation table! The 1950’s were progenitors of modern science fiction with film classics such as Robert Wise’s “The Day the Earth Stood Still”, Fred Wilcox’s “Forbidden Planet”, Don Siegel’s “Invasion of the Body Snatchers”, and Jack Arnold’s “Creature from the Black Lagoon”. Not only was the 1950’s home to amazing science fiction movies, but it was also a time when it seemed like those science fiction movies were turning into reality on a monthly basis. The United States of America (U.S.A) and the Union of Soviet Socialist Republics (U.S.S.R) were launching satellites into space every month. Nuclear submarines successfully dove under the Arctic ice cap and resurfaced triumphantly on the opposite side. Advances in science and technology allowed for the development of the first true computers, atomic energy became a reality, the double helix of DNA was discovered, the first 3-D movie was released, and people could actually buy color television sets for their homes! The world was full of wonder for many around the world, but it was also a world of deep undercurrents and strife. The United States of America during the 1950’s was home to the Nuclear family, when every household was expected to have one husband, one wife, and 2.5 children (preferably one boy and one girl). The husband was responsible for getting a job and supporting the family while the wife was expected to manage the household and the children. Race and Ethnicity were topics best not discussed and Politics was almost just as bad depending on where you were from. We decided to take this era of technological advancement, of social pleasantries hiding a turmoil of unpleasantness underneath, and have those Science Fiction movies become reality. Welcome to Fight the Zombiearchy! ~Recently downloaded this and I'm massively impressed - Clear well laid out design, an innovative, quick to play system in 10 pages (9 if you discount the cover page) - how can I give this a 5* review? First off, thank you for the kind words, we're glad to hear you enjoy our system! 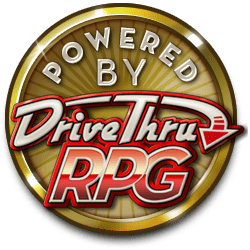 Below is the link to Drivethrurpg's explanation on how to rate and review a product. Hopefully this helps! Addendum: You may only be able to rate and review from a computer/desktop. We cannot find any way to do so on mobile. Figured it out. If you are a Publisher logged into your company account you can't leave reviews. You must be on your personal account.